As Master Planning speeds up and preliminary land tests get underway for VERTICAL MEDICAL CITY at 1000 N Orange Avenue, and after a Christmas Eve FAA Approval to become tallest structure in downtown Orlando's Central Business District, PONTE HEALTH opens first bid for naming privileges offering the Public Courtyard to the highest bidder. 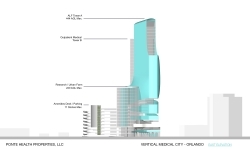 Orlando, FL, January 09, 2019 --(PR.com)-- As Master Planning speeds up and preliminary land tests get underway for VERTICAL MEDICAL CITY at 1000 N Orange Avenue (VMC ORL), and after a Christmas Eve FAA Approval to become tallest structure in downtown Orlando's Central Business District, PONTE HEALTH opens first bid for naming privileges offering the Public Courtyard to the highest bidder. Opening bid price for naming privileges of the VMC ORL's Public Courtyard is $150,000.00 USD for privileges to last 5 years, and bid ends on March 1 2019. VERTICAL MEDICAL CITY - Orlando is a new $1.1B, 2 Million SF 3-tower project slated to open in 2023 with uses to include primarily Assisted Living and Memory Care, also including Class A Medical Office Space and a Research and Development Facility. The Project's Public Courtyard is projected to be approximately 0.75 acres (32,670 SF) and has a projected circulation of 1,500-2,000 people daily. The team's timeline for the next few months includes a Site Plan approval process simultaneous with Master Plan approval working alongside the City of Orlando and other public agencies, tasks to be finalized before the summer to break ground later this year.